Calling the four years of TRS rule in the State as the golden era of welfare, KT Rama Rao Rythu Bandhu, Rythu Bhima, 24 X 7 free power supply to farmers, timely supply of seeds could bring in a marked improvement in the State. File photo of Minister KT Rama Rao. Hyderabad: KT Rama Rao said that inspirational leaders successful in leading great movements seldom become good administrators. People of Telangana are lucky — as Union Finance Minister Arun Jaitley has admitted : KCR had left an indelible imprint of his own not only as a fighter for the cause of Statehood but also as an able administrator after the Statehood was achieved. This fact was acknowledged both by his critics as well as political adversaries. Calling the four years of TRS rule in the State as the golden era of welfare, he said Rythu Bandhu, Rythu Bhima, 24 X 7 free power supply to farmers, timely supply of seeds and some of the new administrative reforms initiated could bring in a marked improvement in the State. Conscious efforts were made to address the farm sector crisis. Telangana had emerged No. 1 in the implementation of key programmes aimed at addressing different issues, including infant mortality and maternal mortality. As a result, the State had topped the lists in respect of 16 different parameters of performance this year. Even the Ministry of Social Empowerment and Justice gave an award to Telangana for the best implementation of welfare measures for the differently-abled in the State. Similarly, the 3,400 tandas and habitations were given gram panchayat status and they will have elections soon. The government, after a long gap of six decades, reorganised its revenue administration by creating 21 new districts besides more mandals and revenue divisions. No Chief Minister had ever touched these areas aimed at taking the administration to the people. The Minister said Telangana was way ahead of others sustaining its 17.17 per cent growth, thanks to the special attention paid to the rural economy and traditional occupations. Mission Bhagirata and Mission Kakatiya, the flagship programmes of the State government that are aimed at extending tap water to every household and irrigation, helped in instilling confidence among the people. Even the farmer suicides registered a downtrend. This was admitted by Minister of State for Agriculture and Farmers Welfare Parshottam Rupala in Parliament. The State government has also reached out to weavers, who had for long been at the receiving end, with the much-needed support. Coming down heavily on N Chandrababu Naidu for his alliance with the Congress, Rama Rao said the TDP chief had never won on his own in any of the elections. He gets bailed out in every election depending on other parties. He had an alliance with almost every political party barring the YSRCP so far. He may go even for a tie-up with the YSRCP if the situation warranted. The TRS had nothing to do with the TDP. He said Chief Minister K Chandrashekhar Rao had laid a strong foundation for development in three key sectors — irrigation, education and health. Over Rs 25,000 crore was being spent every year on irrigation. The Kaleshwaram project will bring about a marked change in the irrigation sector benefiting an ayacut of 38 lakh acres. In the education sector, over 2.6 lakh students were enrolled in residential institutions and over Rs 1.5 lakh was being spent on each student. Programmes such as KCR Kits and Kanti Velugu changed the perception of the people towards government hospitals. On the court orders to allow Dharna Chowk at the Indira Park, he said he would welcome it. There were no GOs issued against Dharna Chowk. The police decided to have it elsewhere in view of local conditions. Rama Rao took serious exception to a report that appeared in a section of media highlighting the monetary dimension to the son and father relationship between him and his father, K Chandrashekhar Rao. In an affidavit submitted by Chief Minister K Chandrashekhar Rao to the Election Commission while filing his nomination from the Gajwel assembly constituency, he had acknowledged to have borrowed Rs 84 lakh from KT Rama Rao and Rs 24 lakh from his daughter-in-law K Shilaima. 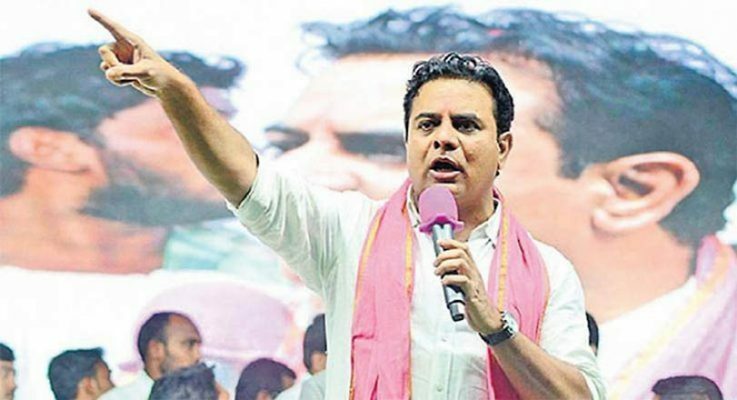 Replying to query from a scribe who wanted to know when the Chief Minister was going to repay what he had borrowed from him, KT Rama Rao termed that the report itself was silly and it did not merit publication. He wondered whether there would not be any financial dealings between any father and son. Fulfilling one of key promises made by the party on provision of employment to the jobless, Rama Rao said that a three-pronged strategy adopted by the government in addressing unemployment started yielding results. Of the 1.09 vacancies identified in different government departments, proposals for filling up 87,000 vacancies have got the green signal from the Finance Department. Some 38,000 jobs were filled by the Telangana Public service Commission without complaint or accusation against the government. The self-employment opportunities were also created in a big way. The new industrial policy helped in getting investments to the State which added to the employment opportunities in the private sector, he said. The MoUs signed by the government with the organisations concerned were vigorously followed up. With an installed capacity of 3,300 Mw of solar power, the State stood on the top of the renewable energy sector. Hyderabad had been adjudged as the city with the best quality of life in Mercer’s global livability index for the past four years because of the best law and order conditions and improved water and power supply, the Minister said. Similarly, the government had made every efforts to make best use of the 1,200 tmc of river water allotted to the State as part of its riparian share in both Krishna and Godavari. The Telangana government had organised the World Telugu Mahasabha in Hyderabad demonstrating its urge to promote and support Telugu. Rama Rao said self-certification in which TDP chief and AP Chief Minister N Chandrababu Naidu had often been indulging in was rejected by the people in 2004. Making a sarcastic reference to his claims, he said if Naidu still goes on claiming credit for laying the foundation stone for Charminar or building the Salar Jung Museum, it will not have any impact. Replying to a question, he said the administrative skills that Naidu claims to have would come up for scrutiny of the people at the hustings on December 7. It is a known fact that Prime Minister Narendra Modi is a political adversary of the TRS, he said adding that the BJP will be deprived of even deposits by the TRS in 100 of the 119 Assembly constituencies it is going to contest in the State. However, Modi had acknowledged that Chandrababu Naidu, instead of focusing his attention on the administration, had wasted his time on trivialities while Telangana Chief Minister K Chandrasekhar Rao made best use of his time for implementing novel schemes for the benefit of the people in his State. The Minister said he had asked people in the State to vote for TRS making a comparison of the TRS rule in Telangana with that of TDP in Andhra Pradesh. People in Aswarapet, Sathupali and Madhira wherein he had campaigned on Wednesday, had acknowledged that there were no programmes such as Rythu Bandhu, Rythu Bhima and 24X7 free power supply for farmers in Andhra Pradesh. He stressed that people in the State had a better understanding of the special programmes being implemented by the State government.